The consensus in the podcast was that governments will not tax pollution enough to force ‘the market’ to save the climate. Instead of the stick of taxes we must use the incentive of investment opportunity. But do we trust markets? A decade and a half ago, Congress was hand-wringing about impending shortages of oil and natural gas… Today, America is the world’s largest producer of natural gas and is an oil powerhouse, ready to eclipse both Saudi Arabia and Russia. fracking could not have taken off so dramatically were it not for record low interest rates after the 2008 financial crisis. In other words, the Federal Reserve is responsible for the fracking boom. 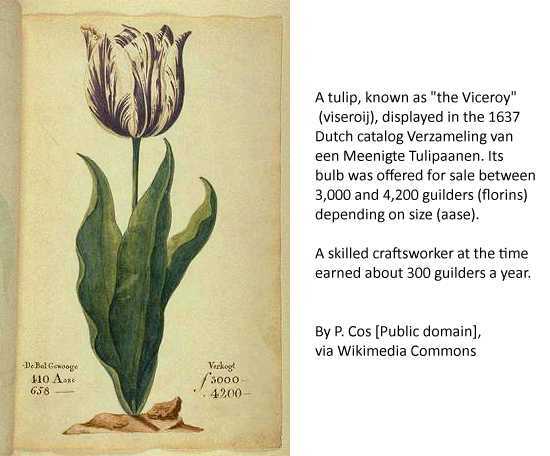 Tulip from the Dutch Tulip Mania of 1634 to 1637. Sir Isaac Newton invested in the South Sea Bubble and said: “I can calculate the movement of the stars, but not the madness of men”. Is letting the market solve the problems of our climate and the future of life on Earth gambling on “the madness of men”? This may be caused by powerful interests pressurising both scientists and politicians. There are also the perverse and deranged who make “threats against the well being” of scientists and their families. 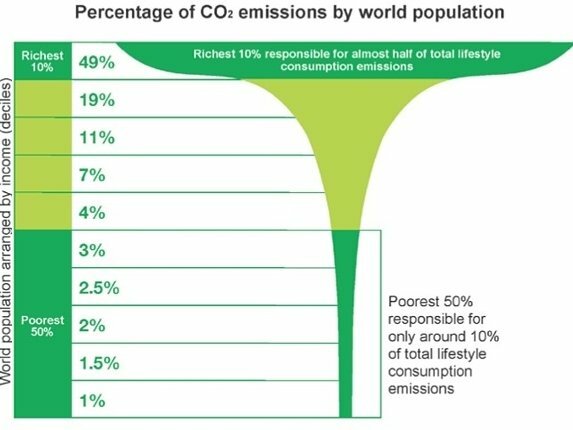 At the Jeff Ball’s position in the policy spectrum there are those that believe markets can develop technologies that will save life on Earth and allow the world’s population to live like the affluent in developed countries. Examples of possible technologies are: (1) Capturing CO2 to make gasoline to keep cars rolling and planes flying or (2) Covering roads with solar panels to make cheap and clean solar energy. There are processes being developed where CO2 is directly captured from the air, then combined with hydrogen produced from clean electricity to form liquid fuels like gasoline. One of the companies in this field Carbon Engineering, reported their progress in December 2017. Last week, the Carbon Engineering team demonstrated “Air to Fuels” by directly synthesizing a mixture of gasoline and diesel using only CO2 captured from the air and hydrogen split from water with clean electricity. A thermodynamic analysis estimates that the theoretical minimum energy requirement for [Direct Air Capture] is 30 kJ per mol CO 2 204 (0.68 GJ per tCO 2 ). In practice, technologies are likely to require 10 times this amount, but even at that energy requirement combined cycle gas power, which produces c. 10 GJ per tCO 2 emitted, could potentially be used for net removals. Nevertheless, most designs anticipate the use of renewable energy or waste heat as far as possible. In the video shown above, the CEO of Carbon Engineering hints that tens of thousands of their CO2 capture plants could make the world carbon neutral. This suggests that several hundred of these would be needed to capture the emissions from UK consumption. One of the first solar roads to be installed is in Tourouvre-au-Perche, France [has] a cost of €11,905 ($14,000) per installed kW… The road’s capacity factor—which measures the efficiency of the technology by dividing its average power output by its potential maximum power output—is just 4 percent. By contrast, the Cestas solar plant near Bordeaux, which features rows of solar panels carefully angled towards the sun, has … a capacity factor of 14 percent. 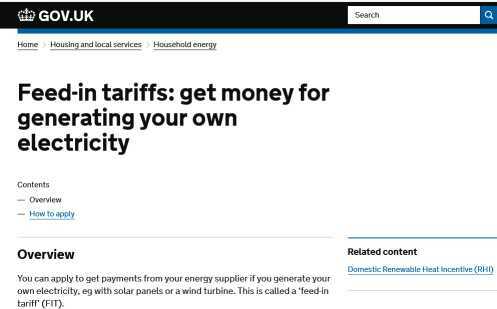 And at a cost of … €1,200 ($1,400) per installed kW, one-tenth the cost of our solar roadway, it generates three times more power. CO2 extraction may be a helpful in dealing with climate change – if anyone is prepared to pay. Solar roadways appear to be – well – useless.. A background assumption or ‘dog whistle’of both these examples is that there are easy ways of dealing with climate change that do not disturb the way of life of the 10% richest too much – and those that aspire to their way of life. 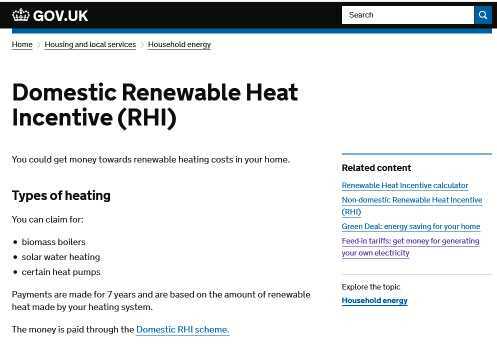 The Renewable Heat Initiative has been criticised because it has, for some installations, had the perverse incentive of encouraging people to produce heat without conserving it. e.g. running the biomass boilers just to get the payments and opening the windows to keep cool. 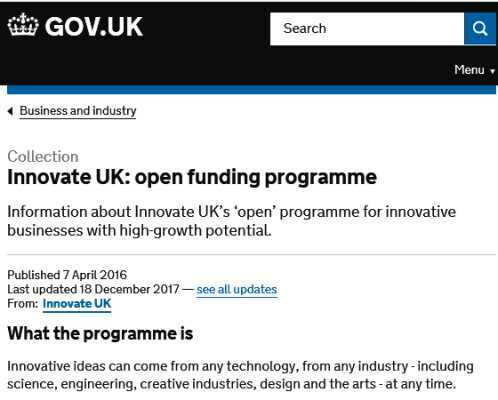 The UK Government’s Innovate UK has an open funding programme: to provide businesses with grants to develop game-changing or disruptive ideas. The Patent Box enables companies to apply a lower rate of Corporation Tax to profits … if your company is liable to Corporation Tax and makes a profit from exploiting patented inventions. This means that while employing a slightly smaller proportion of the workforce, the owners of intellectual property get a greater share of the nation’s GDP. A patent is a form of intellectual property. A patent gives its owner the right to exclude others from making, using, selling, and importing an invention for a limited period of time, usually twenty years. Patents do provide incentives for research and development. That is why the success of government schemes to support innovation is often measured by the number of patents they generate. However, strong criticisms have been made, suggesting they can inhibit development. Watt stifled other developments with his patents & other patents stifled his development. During the period of Watt’s patents the U.K. added about 750 horsepower of steam engines per year. In the thirty years following Watt’s patents, additional horsepower was added at a rate of more than 4,000 per year. 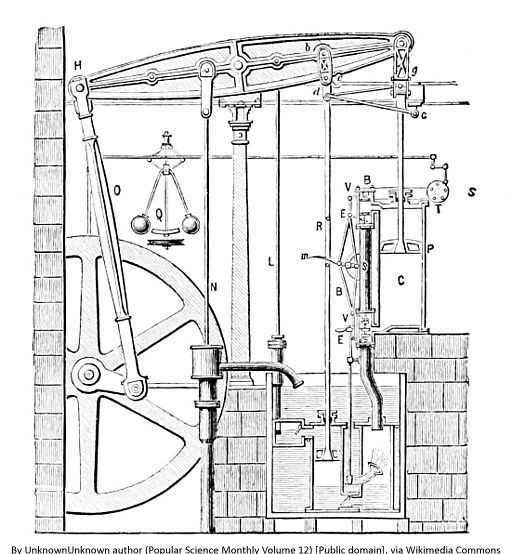 Moreover, the fuel efficiency of steam engines changed little during the period of Watt’s patent; while between 1810 and 1835 it is estimated to have increased by a factor of five. After the expiration of Watt’s patents, not only was there an explosion in the production and efficiency of engines, but steam power came into its own as the driving force of the industrial revolution. Boldrin & Levine also describe how the development of Watt’s own engines were hampered by patents held by competitors. Patents did not hamper the development of computers much. 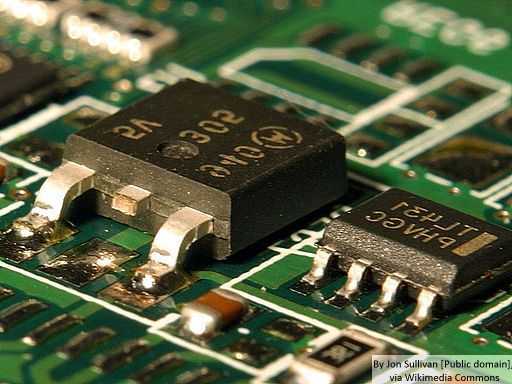 In addition, the military services that had begun to support Bell Labs’ transistor research also encouraged the dissemination of transistor technology. Widespread adoption was essential to the realization of the economic benefits of innovation in electronics, and this is likely to also be true in the case of technological solutions to global warming. Paradoxically, one important consequence of federal R&D programs and other policies in information technology was the development of a relatively weak intellectual property rights. In short, policies that encourage innovation that overemphsise intellectual property can inhibit innovation. Decades can pass before a useful innovation realises it’s potential – and with climate change we haven’t go the time. If we must follow Jeffrey Ball’s advice and pay wealthy polluters to save the world, we must avoid the trap of intellectual property that is too strong and pervasive. The world must reduce GDP to save the climate because nearly all the activities that GDP counts create greenhouse emissions. The emissions per unit of GDP may be falling (less than is often trumpeted) but it isn’t happening fast enough. For a few decades at least, GDP must fall if we want life on Earth to survive. As a personal contribution to degrowth, I don’t fly in planes, travel in cars (much) and hardly consume meat (especially beef). I also try to avoid buying goods with a high element of intellectual property because much of my expenditure will go to the richest 10% of the world via investments. e.g. Pension funds profit from investments in Amazon, Netflix and Facebook paying dividends to the retired wealthy, who might just take that polluting extra holiday flight. But I have an innovative scheme for encouraging climate friendly behavior. If I go to Innovate UK and say “I’ve this effective scheme for cutting carbon emissions: a publicity campaign to shame car travel, air flight, building high buildings and beef consumption”, what will they say?